After finding out that she is a Shadowhunter, Clary tries to get used to her new life. But since there are all kinds of weird murders going on, that doesn’t go very well. Jace gets kicked out of the Institute, picks a fight in a werewolf bar, only to be saved by Luke (the leader). It is revealed that a werewolf child has been killed nearby. After some persuasion from Luke, Jace goes back to the Institute and finds out that he was kicked out because the Inquisitor is coming. (Trust me, you don’t want to know this woman.) So Alec and Isabelle’s mom only tried to save Jace when kicking him out. Apparently. But, Jace being Jace, he does something to insult the Inquisitor and gets locked up in the Silent City. When Clary, Isabelle and Alec go to rescue him, crazy things start happening. Jace, in his cell, sees Valentine (his father) killing the Silent Brothers. It’s a bit of a bloody mess. Obviously Jace can’t stay imprisoned in the Silent City, but the Inquisitor still wants to punish him and sends him to be a prisoner in Magnus Bane’s house instead. However, Jace gets an invite to visit the Faerie Queen in her court. Clary is tricked into eating faerie food, and can only leave if she does what the Queen wants, this being kissing the person she most desires to kiss. AND JACE KISSES HER. (They’re brother and sister, but you know, whatever.) Simon storms off because he’s angry and all. Remember how Simon went to the Hotel Dumont and got vampire blood in him in book one? Well, things sort of went downhill from there. Raphael (vampire leader something) shows up at the Institute with Simon half-dead in his arms. If they want to save him, they must bury him and let him become a vampire. So they do. Simon-the-vampire is in Luke’s house when Maia (the werewolf girl) shows up injured, being attacted by demons outside Luke’s house. Jace and Clary go outside to fight the demons and they flee after seeing a rune on Clary’s arm. Apparently, Clary has a gift for runes and can make whatever she wants. When everyone is asleep, Jace steals Raphael’s motorcycle and goes to a ship where Valentine is. Valentine tries to convince him to join his army and Jace refuses, but the Inquisitor finds out he was there and wants to trades Jace’s life for the Mortal Instruments. Obviously, Valentine just takes Jace instead. He also takes Simon and Maia. This is where things get kind of crazy. On the ship, Valentine kills newborn vampire Simon, but Jace manages to bring him back to life by feeding him his blood. When all kinds of Shadowhunters get to the ship to fight Valentine, the Inquisitor suddenly recognizes Jace as something we’ll find out in book 3 (yay) but dies before being able to tell him. 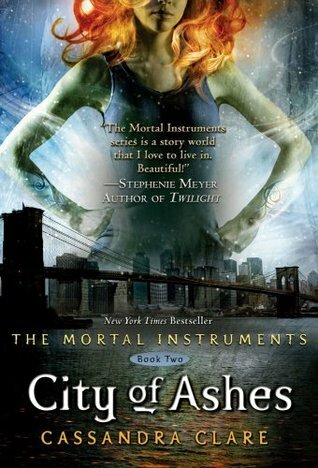 Luke confesses his love for Clary’s mother, Clary and Simon break up, and Jace promises Clary he will only be her brother from now on. Outside the hospital, Clary meets a woman named Madeleine, who tells her she knows how to wake up Clary’s mom.